All you really need to know about Baby Driver is that it’s the best film of the year so far, hands down. The picture was written and directed by Edgar Wright, who is best known for a trio of British comedies starring Simon Pegg: Shaun of the Dead (2004), Hot Fuzz (2007) and The World’s End (2013). Wright ventured across the Atlantic to Atlanta to shoot his latest offering, a labor of love a couple of decades in the making. For, this genre-defying tour de force had its genesis in “Bellbottoms,” a discordant punk anthem he considered a song in search of a car chase from the moment he first heard it way back in 1995. 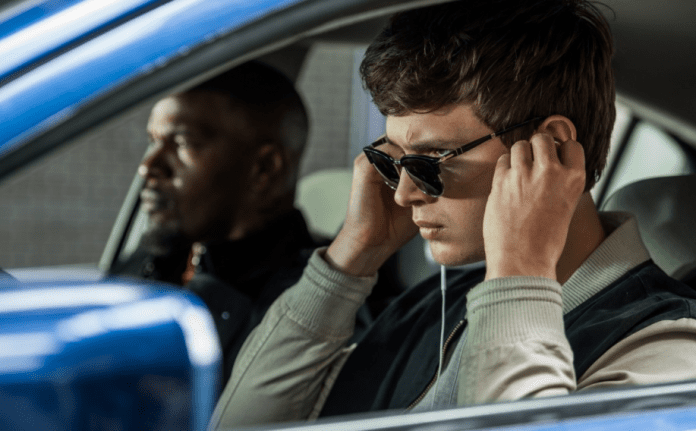 And that cult classic isn’t the only obscure tune on Baby Driver’s eclectic soundtrack featuring rarities ranging from T. Rex’s “Debora,” to Blur’s “Intermission,” to The Damned’s “Neat Neat Neat.” But the adrenaline-fueled blockbuster has its share of readily-recognizable hits, too, like the Commodores’ “Easy,” Martha Reeves and the Vandellas’ “Nowhere to Run” and “Hocus Pocus” by Focus, famous for its yodeling. Unfortunately, Machiavellian Doc insists he first serve as wheelman for the proverbial “last big heist” being pulled by a trio of certifiable lunatics in Bats (Foxx), Buddy (Hamm) and Darling (Eiza Gonzalez). When the robbery goes wrong, the ever-resourceful Baby’s survival instincts kick-in in a primal urge for self-preservation. A mind-blowing, roller coaster ride you’ll never want to end!